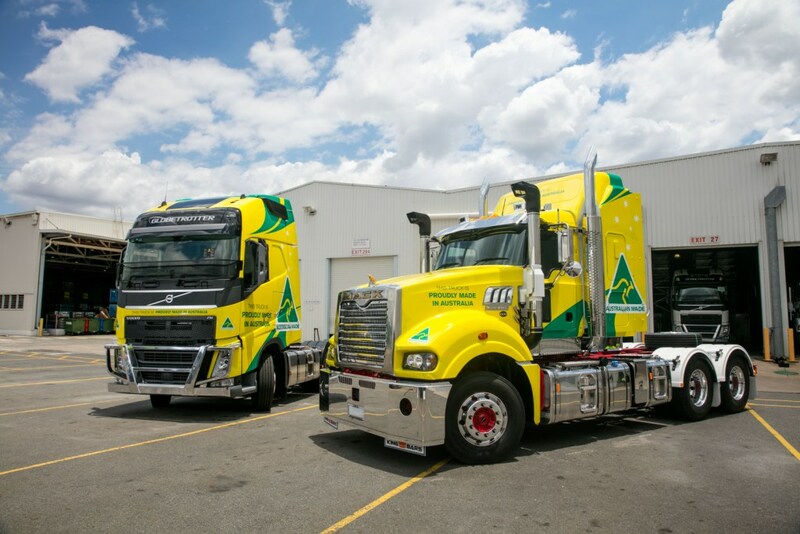 Australian Made Campaign Chief Executive, Ian Harrison, has unveiled the largest fleet of certified Australian-made trucks at Volvo Group Australia’s headquarters in Brisbane. Speaking at the fleet’s launch ceremony, Mr Harrison said the green and gold buses will display the Australian Made logo nationwide, proving that automotive manufacturing in Australia is far from over. “We are thrilled these green-and-gold giants will be trucking around the country celebrating the Australian automotive manufacturing industry,” Mr Harrison said. Volvo Australia President and CEO, Mr Peter Voorhoeve, said that move highlighted the ongoing success of the Group’s Brisbane-based Wacol plant. “Our Wacol plant has been operating since 1972, and houses manufacturing and engineering facilities to produce both Volvo and Mack trucks,” he stated. He said building trucks locally meant the company could meet and exceed the demands of customers, by building exactly to their specification. “We have close to 450 people directly employed in the production process, about 50 dedicated engineers based in Brisbane. The Wacol factory also has approximately 85 local suppliers delivering more than 3,500 different components to the Wacol factory – of which, many are produced right here in Australia,” Mr Voorhoeve continued. According to him, the Volvo Group and its private partners will have invested about $160m in their dealership and service network by next year. “The road freight transport industry is generally quite humble, and rarely in the spotlight despite being a $42 billion industry. Almost everything we touch, eat and use has been on a truck at some stage,” he concluded. Volvo Group Australia, which is the largest automotive manufacturer in Australia, is currently the only manufacturer of certified Australian-made trucks in the country.